When I leave this beautiful island of Mauritius, there are many things I’m certain I’ll miss: the kind-hearted local people, the array of cultures, street food, Sega music and dance, the beautiful shades of the ocean, and the spectacular landscape. Having been so accustomed to island living, I’m also aware that I’ll likely struggle with a few things once I arrive at our next destination. I clearly remember my sister being hit with reverse culture shock when she returned after two years of teaching English in small cities throughout China. Leaving the new friendships I’ve forged over the past three years will definitely be hard. I was desperately lonely when we first arrived in Mauritius and these friends have been my island family and instrumental to our family’s happiness here. Moving back to a place where you feel obsolete, like just another person in the crowd, may be difficult for me to swallow after living in such a small island community. Those of you who live on small islands or towns will understand this one. I don’t have a car so I walk everywhere and due to this I have met a lot of people and have quite a few acquaintances. Walking from my home to the local shops is a social activity and cannot be rushed. I will miss this. One island life struggle though that I imagine will not be quite so difficult for me elsewhere is the challenge of living in a land of many languages and knowing when and where to speak which of them. You see, I always tend to speak French to the local café owner who’s British, Creole to the French yoga teacher, and English to my Creole friend because at this point, I’m just so damn confused. I’ll be at the shops and see someone I know and greet them with “bo” “he” “ki” trying to greet them in all 3 languages simultaneously before dropping my head and avoiding eye contract while I slowly back away to the wine aisle. Maybe I should resign myself to the fact that I am an amateur in French and Creole, stop trying to be Little Miss Perfect, and take a leaf out of my dad’s book and take the opportunity to talk French or Creole to everyone I meet now and at our new destination. My dad is really my language learning hero. He will proudly and happily walk into the local coffee shop or service station (in Australia) and, grinning from ear to ear, he will proudly say to the confused attendant, “Bonjour mon petit chou. Comment ça va? Un café s’il vous plaît.” (Translating to: “Hello my little cabbage. How are you? One coffee please.”) He will then laugh and explain what he said and that he is practicing so he can talk confidently to his son-in-law and his family, and leave the store with a little skip in his step and a nice hot cappuccino. He is neither embarrassed nor discouraged by their response. In most cases, they now play along. Once in a while he is bowled over as someone replies in perfect French or he gets all confuddled and excited if someone ups the ante and replies in Mandarin or Portuguese. In any case, the number one rule of learning any language is not to be embarrassed to talk – no matter how simple the words are, how repetitive the one sentence you can say is, or how many mistakes you make. Dad is my language learner hero because he tries daily, repetitively, without giving one hoot what anyone else thinks. Mauritius will always hold a piece of my heart. I have experienced both the best and hardest days of my life so far here. I can say without a doubt that living on this little Island has helped shape the woman I am today: more resilient, independent, flexible, and happier than ever, with a little side of island time thrown in for good measure. It will be hard to leave everyone we love and of course this beautiful Island we have called home for the past three years. Regardless of how we negotiate the changes to come, I am sure we will return to our little island in the Indian Ocean again. In the meantime, I will use every chance I get to practice my newfound languages on my children, husband, and, of course, my dad. 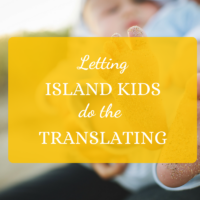 And in any case, we will continue to encourage our kids to keep speaking the languages they learn throughout our travels. It certainly won’t be too long before they start teaching me. I already get the eye rolls when I pronounce something wrong – and they are only four and five years of age. On top of this, my mum’s mother tongue is Dutch, my husband’s is of course French and Creole (and he also has a basic understanding of Spanish), and my sister can speak a working level of Chinese! It’s clearly time for me to get my act together. Until next time, goodbye, sweet Mauritius. Au revoir, orewar, zài jiàn, adeus.